-	Professional home whitening kits Both procedures are based on a bleaching process that uses a peroxide-based bleaching gel of varying strength (3%-6% peroxide). The higher the concentration of peroxide in the gel, the more powerful it is. While a higher concentration gel is more effective at whitening the teeth, it also has greater potential to cause side effects such as sensitivity and damage to the surrounding gum tissue and your lips. Prior to carrying out the procedure you would have a consultation with your dentist to make sure that you are suitable for teeth whitening and to explain possible risks and side effects of the procedure. Most dental practices will ask you to sign a teeth whitening consent form to confirm that you have fully understood the procedure and all risks. Before the teeth whitening process is started a dentist or a hygienist will thoroughly clean the teeth, removing any surface stains and tartar. This procedure is commonly referred to as a scale and polish. The area is then prepared for the procedure. The bleaching compound usually contains a high concentration of peroxide (up to 6%) and so the dentist will usually place some form of protection around the gums so that only the teeth are exposed to the compound. This involves covering the gums with rolls of cotton and a protective gel material that hardens once applied to the gums. A cheek retractor is used to keep the lips and cheeks away from the teeth. It is very important that your dentist isolates your gums and lips with a protective material in order to avoid any potential damage or burning. Home whitening kits usually have a low concentration of peroxide so that there is less chance of any damage occurring. Recently, high-strength home whitening kits purchased online and from certain stores have attracted media attention with horror stories of people with badly burnt lips and gums. It's for this reason that teeth whitening should always be carried out under the supervision of a dentist. Eye protection (goggles) is also provided to prevent any damage to the eyes from the laser used or any accidental splashes of the peroxide. Many cosmetic practices now offer "DVD glasses" so that the patient can watch a movie during their treatment! The whitening gel is then applied to the surface of the teeth and exposed to a light or laser, which activates it. Some systems do not use an activating laser and many dentists argue that the laser doesn't make any difference to the end result. During this process if you feel that your lips or gums start to burn then you should let your dentist know immediately. After approximately 15 minutes the gel is removed and the process repeated another 2 times. 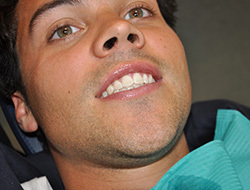 During the procedure some people may feel sensitivity in their teeth, which are described as short-lived shooting pains. The dentist will finally wash off the whitening gel and remove any gum protection before evaluating the final result by taking a photograph or using a shade chart. The results are usually quite dramatic and can often be up to 10 shades lighter. A kit for home whitening may also be provided with custom trays and professional whitening gel. Many patient's teeth are quite sensitive immediately following this procedure and it is advised to try and avoid hot or cold drinks for a while. Some dentists offer fluoride treatment following teeth whitening to reduce this effect on sensitivity. Your home whitening kit usually contains a solution to reduce tooth sensitivity. Sensitivity rarely lasts more than 48 hours, if symptoms persist for longer than this then contact your dentist. Once your treatment is complete your dentist will remove the gel and a shade guide will then be used to measure how much whiter your teeth have become during the procedure. The results are instant and can often be up to 10 shades lighter. Professional home whitening kits provide more permanent results over a longer time scale, whereas laser tooth whitening offers immediate results. A combination of the two provides the perfect solution to both immediate and long-term whitening needs. To make a professional home whitening kit, your dentist will take a impression (mould) of your teeth using a special dental putty. Your dentist's technician will then use this to cast a model of your teeth from plaster and make your custom teeth whitening trays from this. Once these trays have been made (usually takes 5-10 days) you use them in combination with professional whitening gel (provided by your dentist) until you are happy with the results. 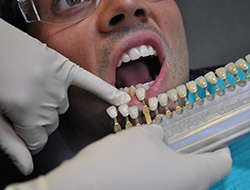 Depending on the teeth whitening system, some trays need to be worn overnight while others for only 1-2 hours a day. 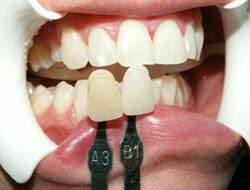 This varies from individual to individual, and also depends on the type of whitening system used. Some people respond very well to teeth whitening and have dramatically whiter teeth as a result, whereas others may notice very little difference at all. People with heavily stained yellow teeth tend to have more dramatic results than those with slightly discoloured teeth.Your dentist will be able to advise you on the likely results following a consultation. Some people experience no pain or sensitivity with their teeth. However, the majority of people will experience some kind of sensitivity either during and/or after the initial treatment. This is usually described by patients as sporadic, sharp shooting pains coming from their teeth. This should settle down after approximately 48 hours though. Your dentist may give you a special gel or mousse to apply to your teeth to help with the sensitivity. It is advisable to avoid hot or cold food and drinks within the first 48 hours of your whitening treatment. Which teeth-whitening brand or system is the best? There are many different brands of professional teeth-whitening systems, each claiming to provide the best results. The most popular systems are Zoom!, as featured on Extreme Makeover, Opalescence , BriteSmile and the latest Enlighten system. Each system has its pros and cons, and your dentist will be able to advise you on which system would be best suited for your teeth. -	The specific clinic where your whitening is performed. -	The teeth-whitening system used. -	The location of the clinic. -	The skill of the dentist performing the treatment.